I put driving in quotation marks because we haven’t done any of it ourselves since we arrived. We have been chauffeured around Bangalore by Mr. Kumar, a very able driver and magician. Driving in India is magic because you see it happen before your eyes but have no idea how it really works. Bangalore, like most large cities, has roads with dividing lanes and driving regulations. The problem for me, as a westerner, is that none of these seems to function as I would expect. I have come to realise that the painted lane markers on roads are used to help drivers centre their cars directly on top of the white line and driving regulations are mere guidance as to how one could drive if one wished. The Bangalore traffic authority regularly reminds drivers of this guidance with signs such as “Follow Lane Discipline”. The signs are, of course, mere guidance as to how one could drive if one wished. Drivers in Bangalore seem to follow their own inner lane discipline which, as far as I can see, involves no form of discipline whatsoever. At any given time of day or night, the width of a two-lane road has 5-6 vehicles, not all of which are in a forward-moving direction. By “vehicles” I mean cars, trucks, auto-rickshaws, motorcycles, scooters, bicycles and cows. The cows, like everyone else, follow their own inner lane discipline, which usually consists of standing perpendicular across a few of them. This in no way hinders drivers of other vehicles. They merely cross over to the opposite side of the road to avoid the cows. The licence plates in Karnataka State (of which Bangalore is the capital) all begin with KA followed by numbers. In Bangalore, the licence plates are numbered KA01-06. 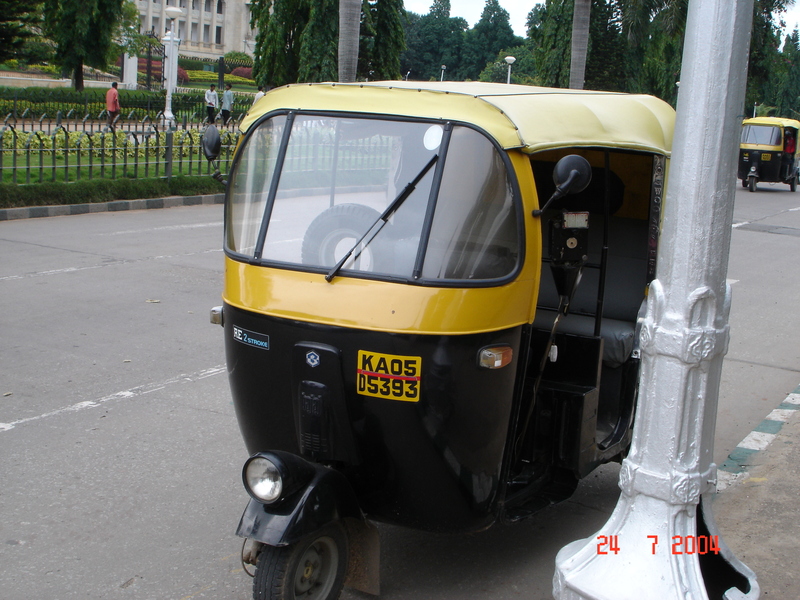 The auto-rickshaws have their licence number painted on the sides of the vehicle. Those carrying the licence plate KA05 are especially interesting as the “5” looks like an “S”, which, when pronounced, aptly describes the driving conditions in Bangalore: total “KAOS”. Yesterday we were stuck (and I mean stuck) in a traffic jam for 15 minutes. A small scooter with a driver and two passengers was weaving in a perpendicular manner through the halted traffic when Mr. Kumar remarked that carrying two passengers on a scooter was not allowed. Blocking 5-6 “lanes” of traffic in order to make a right-hand turn into oncoming traffic elicited no such comment. Too much traffic? Cross over to the oncoming traffic lane. I have yet to see an accident in Bangalore, but I read about them in the newspapers. I did see one very interesting contraption that I have not seen elsewhere. A red traffic light had a counter attached that counted down the number of minutes/seconds until it turned green. I think this is an excellent invention which alleviates some of the stress of being stuck in traffic: at least you know how long you will be stuck and, while waiting, can relax and take in some of the roadside sights of Bangalore. In a word, it is excellent. We have been back to the same restaurant, Nandini, several times to delight in a south indian meal called a “thali”. First, a large silver tray in the shape of a banana leaf is placed on the table. Its shape is very handy since what follows is the placement of a large banana leaf on the tray. This is followed by a server who arrives with a very large bowl of rice, spooned on to the banana leaf with a flat utensil. The diner has the choice of having ghee (clarified butter) sprinkled on top of the rice. Then, another waiter arrives with 8-10 small silver ramekins containing very good vegetarian things. There are spicy things, not-so spicy things, a soupy thing, a buttermilk/custard thing and a very sweet dessert thing. There is apparently a particular order in which to eat the things but I will have to spend more time learning about this and the names of the things. Only one thing is eaten at a time…no mixing. The way to eat a thali is to pour some of the non-soupy, non-buttermilk things on to the rice and eat it…with the fingers of your right hand only. Both of us have been to Malawi where food is eaten with the fingers of the right hand, so this was no shock. However, it is still easy to tell that we are beginners. We are the ones with leftover bits of rice and other bits sprinked around our banana leaves and our mouths. I have yet to understand how the banana leaves and mouths of Indians show no signs of having eaten. The end of a thali is, thankfully, a warm bowl of water with a lemon to wash the dirty hand. For us beginners, a shower would also help. In July 2004, my husband and I moved to Bangalore, India. He was posted as the Regional Representative for Norwegian Church Aid, one of Norway’s largest NGOs. I went along for the ride. Here are some of the letters I sent to friends and family in 2004 about our strange life in Bangalore. We arrived safely, after a 7-hour plane trip from Amsterdam to Delhi, an overnight in Delhi and a 2.5-hour trip from Delhi to Bangalore. We were met with a warm welcome from our colleagues at Norwegian Church Aid (NCA). They have been extremely helpful in our logistical needs. Our first full day in Bangalore was a very tiring administrative day. It took four hours for me to get our personal effects out of customs. And would you believe that, in the end, the customs officials UNPACKED everything that we had so carefully packed???!!! It was a Kafkaesque experience that I will write more about when I have the energy (and the sense of humour) to relive it all. It was, needless to say, an “interesting” day. We are both quite tired. I guess we’re recovering from the small time difference, lack of two nights’ sleep and the culture shock that is India. Understanding Indians speaking English will take some getting used to. 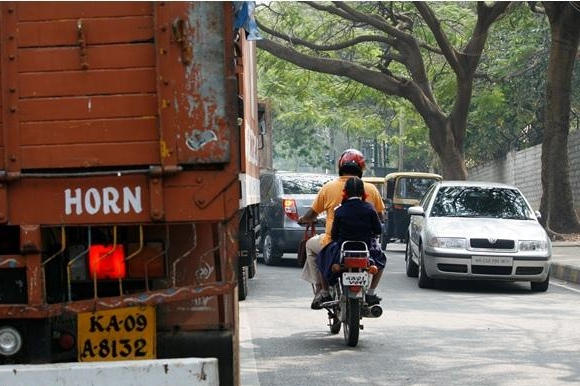 Understanding Indian driving habits will require some out-of-body experience. Understanding that cows have more road rights than pedestrians will take some hours of meditation. Understanding that a car horn is a means of communication, all day and all night, will take some good ear plugs and a cold beer. What do running on ice in the dark and a Rwandan restaurant have in common?